Last week, I tried an experiment. Normally, I publish one or two or three blog posts a week. I hold back a lot of my ideas because I don’t want to email my list too much. But last week I wrote and published a blog post whenever I felt like it. I didn’t hold back. Now, I continued to email my list like normal — but no more than once a day. I picked the best post of the day and let them know about it. I didn’t tell them about the other blog posts, but left it up to chance to see if they’d find them or not. Saturday is consistently my lowest traffic day every single week, so I have noted that above. Monday-Thursday are my highest traffic days. Conclusion: More frequent blog posts generated more traffic to my blog even though I didn’t increase the frequency that I emailed my list. You may find the same is true in your market. It’s something worth testing. While Alexa isn’t perfect, I do like to check Alexa to see how I rank against similar blogs. I also like to analyze the charts to see why I’ve gotten more or less traffic than normal. 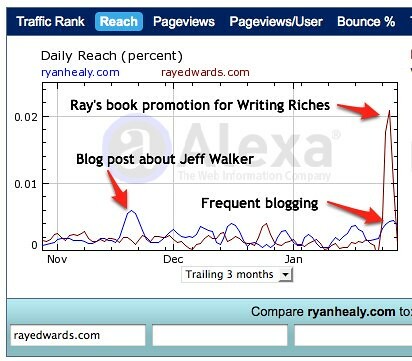 Here’s a chart of my blog’s Alexa rankings compared to Terry Dean’s blog MyMarketingCoach.com. As you can see, our sites have similar traffic levels. But I’ve had a couple recent traffic spikes that are explained on the chart. 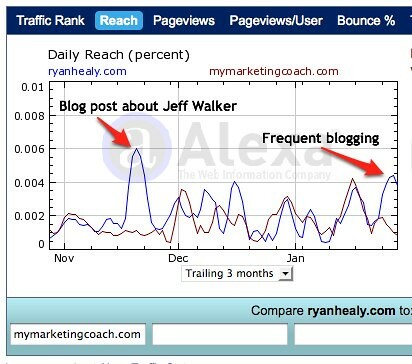 As you can see, my Jeff Walker post and more frequent blogging both created noticeable traffic spikes. But those spikes pale in comparison to an organized promotion where multiple friends and/or affiliates promote your product on the same day or within a narrow window of time. Last week, Ray promoted his new book Writing Riches. I promoted Ray’s book, as did a number of other bloggers and marketers. This caused a massive spike in traffic to Ray’s blog. Get friends and affiliates to promote a product you sell. As the charts above demonstrate, an organized promotion can generate far more traffic than either of the first two strategies. This is because people are generally more motivated by money and obligation than the opportunity to share something new or controversial.